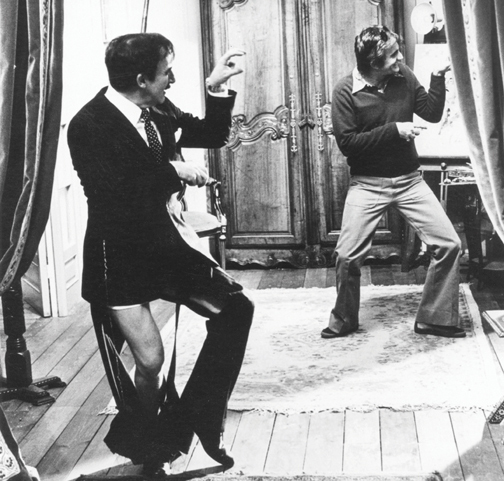 Blake Edwards shows Peter Sellers how it's done. Director/Writer/Producer/Actor Blake Edwards passed away this morning at age 88. His list of credits includes so many classic films it’s kind of incredible — any filmmaker would be happy to have just one of Edwards’ movies on his resume. Some of the greats include Operation Petticoat, Breakfast at Tiffany’s, Experiment in Terror, The Great Race, The Party, 10, SOB, Victor Victoria, and of course, the Pink Panther series starring Peter Sellers. Edwards also brought us the Peter Gunn TV series and feature film (Gunn, 1967) — not to mention the 1987 Peter Gunn TV movie. Nothing I could write here would mean as much as watching some of Edwards’ work, so I leave you with the following clips.